Cowboy Jason Marriage surveys a herd at Deseret Ranch, known for producing high quality calves with a focus on the environment. 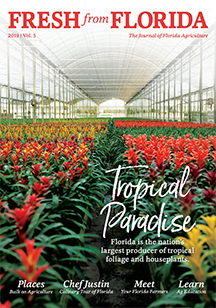 Florida’s one million beef cattle, the second-largest herd east of the Mississippi, graze more than 5 million acres – making Florida cattle farms and ranches vital beef suppliers and significant environmental stewards. Florida’s lush pastureland and the ranchers’ skills are key to the state’s highly successful cow-calf industry. Cow-calf operations raise a permanent herd of beef cattle on the ranches to produce calves for later sale. “Cattle have been part of the environment in Florida for hundreds of years and a lot of areas, even natural areas, benefit from cattle grazing,” says Erik Jacobsen, vice president and general manager of Deseret Ranches. Deseret Ranches keeps 42,500 cows on 295,000 acres in Central Florida. Cattle move between fields while forages grow, the rotational grazing technique used by cow-calf producers large and small. “Allowing the pastures to rest in between grazing gives the grass a chance to regenerate, and this means that we have been able to operate with pretty minimal levels of fertilizer inputs,” Jacobsen says. Florida had 3.75 million acres of permanent pasture in 2012, 528,000 acres more than 2007, according to the U.S. Census of Agriculture. Cattle here also graze on 1.4 million acres of woodland pasture. Ranchers help keep woodlands healthy through rotational grazing and prescribed burning. Calves graze with their mothers for many months. Each cow-calf pair needs five to 25 acres of native range, or up to four acres of cultivated grassland, according to University of Florida specialists. After weaning, calves continue to graze until they reach 750 pounds. Most Florida calves are then fed to finishing weights of over 1,000 pounds at farms in the Midwest. U.S. calf prices hit historical highs in 2014-15. Calves sold for well over $2 per pound for some weights – twice the typical high price – due to a smaller U.S. herd and strong global demand. Beef demand may stay strong, but experienced producers say calf prices will drop as U.S. cattle production expands. “Stay in the cattle business long enough, and you’ll see the highs and some lows,” says Mike Adams, whose grandfather started Adams Ranch in 1937 in Fort Pierce. Four generations live on Adams Ranch, where an 8,000-cow herd grazes on some lands neighboring the Everglades Headwaters. LeeAnn Adams Simmons says the family continues a conservation ethic championed by her grandfather, Bud Adams. “He taught us you should raise cattle in a way that benefits the land and the wildlife here,” she says. 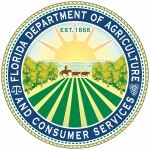 Adams Ranch has used a conservation easement program through the Florida Department of Agriculture and Consumer Services to maintain its land for farming and ranching in perpetuity. More than 10 percent of the 24,000-acre Adams Ranch is under easement. Cattle ranches are important guardians of the state’s water supply and water quality. Florida’s high annual precipitation means that stormwater runoff can be a challenge. Deseret Ranches has turned the challenge into an opportunity by voluntarily constructing a series of stormwater retention ponds to capture and treat runoff before it leaves the property. “This allows us to protect Florida’s waterways and also results in tremendous habitat for wading birds,” Jacobsen says. Deseret Ranches has received several state and national awards for water conservation. Florida cattlemen are also guided by state-developed water quality Best Management Practices for cattle production, which provide methods for nutrient management, grazing and wetlands protection.